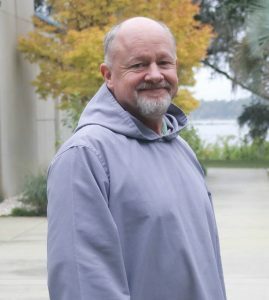 My time spent as a monastic guest at Mepkin Abbey was one of the best months of my life. I hope to join them again soon. I retired September 1, 2017 after over 38 years of military service. I had a four day retreat at Mepkin the end of August and found a draw to the beauty and grace of the place. Praying the hours in community helped deepen my prayer. So, after my retreat I made application to live with the brothers for a month as a monastic guest. I feel like I got to play on the edge of a forested wilderness but in one month’s time I never got so deep that I was “lost in Christ” completely nor forever. I was on the edge and it was wonderful. After returning home for more than a week, now, I know I could get lost in the world again. However, the glimpse of being lost in Christ still inspires me in contemplative prayer and in recognition of Jesus in my day to day mundane activities. Work in the monastic way is meant to be done prayerfully. For Cistercians silence is a goal for prayer or the “ora et labora,” work and prayer. Work at the mushroom farm is practiced with minimal talking. The silent atmosphere does foster a sense of God’s presence in the work. Work is minimized on Sundays and Desert days to allow for rest and an opportunity to go deeper in prayer. My stay included participation with the community in one of their monthly desert days. Its title comes from the practice of the desert fathers and mothers. Mepkin’s beauty is not like a desert but it certainly can be a setting to have a wilderness experience. My visions during the “desert” prayer were definitely forested and I had a sense that I was close to the garden from which Adam and Eve were exiled. Prayer is so personal and the images or symbols that I have from those desert prayers are very difficult to put into words – written or spoken. The depth and wonder of my prayer I credit to the communing I experienced through ora et labora in the Mepkin community. The brothers do not communicate in the worldly sense but they do commune in a divine life. They are human. They are also examples of living Paul’s exhortation “…to present your bodies as a living sacrifice, holy and acceptable to God, which is your spiritual worship.” (Romans 12:1, NRSV) Over the years I have had education and professional certifications that allow me to ethically add titles and letters before and after my name. My month at Mepkin gave me my favorite letters, Carl Rosenberg, MG.